If you want to edit images quickly with basic tools check out Fotograpfix image editor. It is a portable app and light-weight, you can put in your USB key and carry with you. Fotografix allows image editing with basic tools for changing brightness/contrast, color balance, saturating the image and adding filters like motion blur. It doesn’t replace your Adobe Photoshop or other full feature graphic editor but it allows you to do digital photo enhancement, photo retouching etc. It has support for layers for non-destructive editing and scripts support for easy automation of frequent tasks. Fotografix is a portable freeware for Windows and weighs 310KB. The app is currently in beta but works perfectly for simple image editing. Supports all well known image formats. 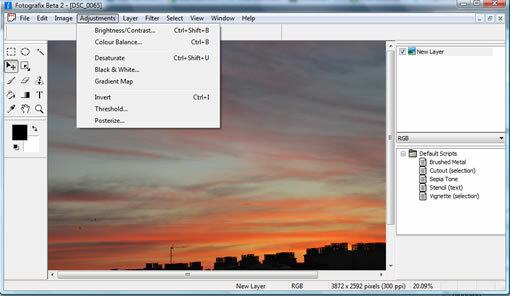 FuturixImager and Artweaver are similarly lighweight desktop apps for image editing.